One of the best things about being an independent producer of a radio program and podcast is hearing from listeners. I do all my work on a tiny scale, without underwriting or anyone to do PR, so I don’t have to deal with too many Russian bots or spam promotions in the comment section on my blog, and my radio and podcast listeners seem exceptionally nice and helpful. I do get more email than I know how to deal with, mostly birding listserv reports, updates from bird and conservation organizations, and spam, with some work-related stuff thrown in. I don’t often hear from listeners, and sometimes when I do, their interesting and important emails get mixed up with everything else, and I lose track of them. If you’ve sent me an email and I responded but never followed up, that’s unfortunately what happened. On Thanksgiving last week, I received a couple of emails from listeners that made me very thankful. Julie in Hollister, Wisconsin, sent me a great article by Patrick O’Connell in the Chicago Tribune detailing how well Sandhill Cranes are doing in the Chicago area and beyond. It notes that in the 1930s, only two dozen breeding pairs of Sandhill Cranes lived in the entire state of Wisconsin. The population in the upper Midwest is now between 65,000 and 95,000, and the increase has accelerated in the past decade. 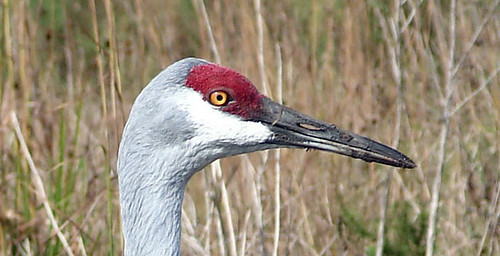 Why are Sandhill Cranes doing so well? Wetlands recovery has been a big part of it, but the president of the International Crane Foundation, Rich Beilfuss, said, “They’ve made this existential decision to live with people, rather than avoid them.” Those of us who live in northern Wisconsin and Minnesota can’t help but appreciate that wonderful increase, too. I just wanted to tell you that you are one of the things I'm grateful for. You made our adjustment to rural WI less ? painful. We had been coming here and owned this property for over thirty years but didn't realize how isolated we might feel actually living here. Your voice w/your mostly uplifting stories REALLY helped us along as we really started our new adventure. ‘Mostly uplifting’ because sometimes you share something that is hard to hear but your take on it makes me feel, well, lets see if we can work to make this better or work. That email left me with a warm glow, as did this one from Joni in Brandon, Florida. I recently discovered your podcast and it is now one of my favorites. I appreciate your passion for and enjoyment of birds. I also like hearing about what is going on in your life and your concerns for the environment. I like your most recent podcast, A November Awakening, and I agree completely about preferring standard time. I am blind, so I can't appreciate the visual beauty of birds, but I love birdsongs and being able to identify some birds that way. Since tomorrow is Thanksgiving I decided it was a good time to send you a note of thanks for all of the work you do. Have a wonderful Thanksgiving and thanks for all the pleasure and insights you have provided via your podcast. I seldom get around to thanking the many people who enrich my life. If a tree falls in the woods and no one is around to hear it, does it make a sound? And if a person produces a program and no one listens, does her work have any meaning? For the Birds would be worthless without somebody out there listening; that is why I am so very grateful to you for listening. Last week on Facebook, a lot of my friends were sharing a short video, on a National Geographic webpage, of a cardinal in Illinois feeding goldfish in a backyard pond. The video had been posted on YouTube in 2010, taken during summer, when adult cardinals are feeding their own young and when some individuals molt all their head feathers—this male cardinal’s head was completely bald. Sometimes the urge to feed transcends species, even class boundaries. This Cardinal was discovered feeding an adopted “brood,” of goldfish. Photo by Paul Lemmons, Shelby, N.C.
Come and get it! Hungry goldfish crowd the edge of a backyard pool in North Carolina as a cardinal passes out tidbits of food. For days the bird followed this strange routine. Alighting on the pool fence, he chirped. As the seven goldfish gathered, he fluttered down and began to feed them. In their eagerness they almost leaped from the water. Food gone, the bird flew off for more. Perhaps this foster parent had lost his own brood. Oddly enough, National Geographic doesn’t make reference to their own publication on that YouTube video, even as they asked scientists what they thought about the more recent occurrence. 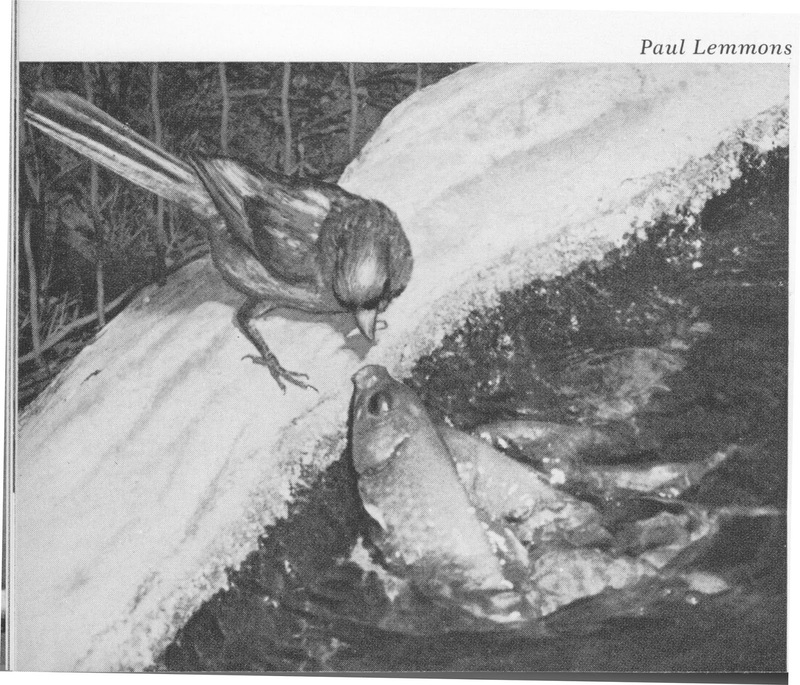 One of them, Robert Mulvihill, an ornithologist at the National Aviary in Pittsburgh, Pennsylvania, mentioned the earlier case, or at least that one of National Geographic Books’ competitors, the LIFE Nature Library books from the 1960s, ran a black-and-white photograph of a cardinal feeding a goldfish. Again, no one thought to look through National Geographic’s own publications. When National Geographic asked various ornithologists, “Why would a bird feed an entirely different species,” Princeton biologist Christina Riehl had the best response. “My best guess is that the appearance of the goldfish’s open mouth at the surface of the water is just similar enough in size and shape to the open mouth of a baby bird that it triggers the instinct in the adult bird to provide food to it,” says Riehl. Nestlings tend to have vibrantly colored mouths, often bright red and yellow. This acts like a bull’s-eye for the parents—a visual cue that says “Feed me here! 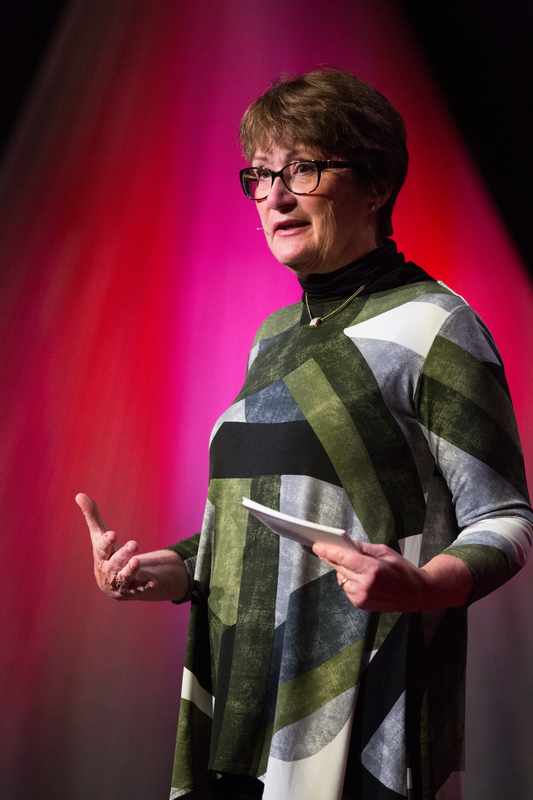 “It’s an amazing demonstration of how simple stimuli can trigger very hardwired behaviors, even in situations that seem obviously wrong to us,” she says. Perhaps the zenith of interspecific feeding of young is represented by a North Carolina Cardinal, Richmondena cardinalis, that was observed for several days feeding goldfish in a garden pool. As the goldfish crowded to the edge of the pool with their open mouths, the Cardinal, standing on the pool’s edge, expertly delivered mouthfuls of worms to them! One can only guess how such a strange association arose, but it seems likely that the Cardinal, bereft of its young, approached the pool to drink, and was met by gaping goldfish accustomed to being fed by humans. The two instinctive appetites, one to feed, the other to be fed, magnetically attracted each other, and a temporary, satisfying bond was set up. Some past For the Birds programs about this. On newer programs, transcripts are usually linked on the related blog post. There are two kinds of people, at least with regard to Daylight Saving Time. Just about all of us are on the same page in hating the twice-a-year time change. The element that divides us is which year-round time system we’d rather keep. Some prefer Standard Time—that is, setting our clocks so that noon in the center of our time zone is when the sun is most directly overhead, what the very term “high noon” is supposed to mean. Others prefer Daylight Saving Time, in which clocks are set an hour later than that. Many bird counts, including the ones I’ve been involved in, use Standard Time for entering data. When I was counting at the Lakewood Pumping Station and at Hawk Ridge, we always called it Bird Time, because birds take no notice of human clocks. The time of sunrise changes in regular increments, earlier each day in spring, later each day in fall, and birds never make a sudden full hour jump in their daily rhythms for no good reason. Even if I didn’t think of it as Bird Time, I’d still definitely be a year-round Standard Time person. When I was a teacher, starting in March each spring I’d go birding before school every morning. Back then, Daylight Saving Time didn’t begin until the last weekend in April, exactly when warbler migration was kicking in, and I’d sorely resent losing a full hour of birding before I had to head to work. Other people prefer that extra hour of sunlight after work, but birds aren’t so conspicuous at the end of the day. When we finally switch back to Standard Time in November, we lose an hour of light in the afternoon, putting it back where I like it, in the morning. 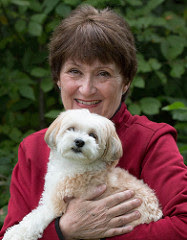 In fall and winter, I usually wake up between 5 and 6, make my cup of coffee while it’s still dark, and then sit with my dog Pip in my office writing or thinking as the sky changes color and birds start flying about. As days get shorter, sunrise keeps getting later. Today, November 21, the sun rises at 7:20 here in Duluth; if we were still on Daylight Saving Time, I’d not seen the sunrise until 8:20. By then, the phone might be ringing or I might be off at an appointment. Things are just too bustling by then to enjoy my quiet alone time. No, I like my sunrises early. This time in November, the first bird to appear in my yard, at just about sunrise, will usually be a cardinal or junco. Both seem to have good low-light vision. Chickadees and woodpeckers sleep in a little longer—maybe being within a cavity helps reduce heat loss overnight, making breakfast a little less urgent, or maybe the outside light needs to be a bit brighter to be noticeable through the entrance hole. Within a few minutes after sunrise, all the birds seem to be up and at ‘em. The first one I hear through tightly closed windows is usually a crow, but sometimes the local Pileated Woodpecker yells out first. Right outside my window is a box elder with a squirrel stick nest. It's too high in the branches for me to see from my desk, but I do notice when one of my squirrels emerges from it to sit for a bit on the broken limb, just three or four feet from the windowpane. She looks out at the morning rather the way I do, except she has no cup of coffee, and she sits on the cold side of the glass. After looking every which way to verify that the coast is clear, she uses her paws and a bit of squirrel spit to wash her face, her body staying cozy under her thick furry tail. 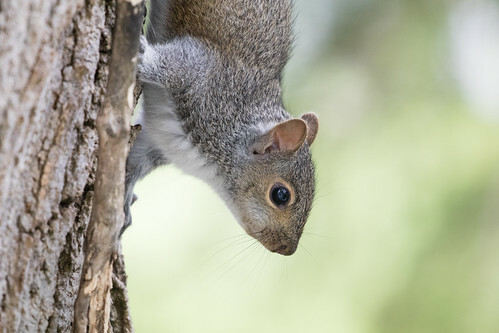 Like birds, squirrels never think about human constructs of time. My squirrel knows that when her face is clean, it’s breakfast time. She starts down the trunk head first, her back legs hanging onto the broken limb for an extra moment as she lets go with her front legs, reaches her paws way out, and stretches. Sometimes the squirrely yoga pose lasts a moment longer, as she opens her mouth in a wide yawn. I smile. Another day has started, and all is right with the world, or at least my little corner of it. Nongame Wildlife: Do words no longer have meaning? The U.S. Fish and Wildlife Service is considering opening up hunting on Trumpeter Swans. In 1936, T.S. Roberts wrote that "The days of the Trumpeter Swan as a bird of Minnesota have long since passed." His research indicated that Trumpeters had formerly been found throughout the grasslands and sparsely wooded regions of the state, but were hunted until they'd been wiped out in the state “even in advance of the destruction of the Passenger Pigeon, buffalo, and antelope.” The last breeding Trumpeter Swans in Minnesota were recorded in 1883. Roberts traced all specimens labeled as Trumpeter Swans taken in the early 1900s, and sadly confirmed that every one of them was actually a Tundra Swan. 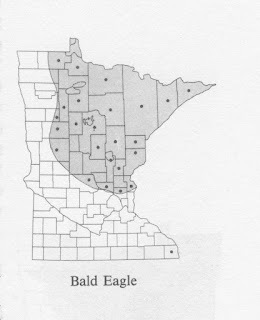 According to the Minnesota Breeding Bird Atlas, "By 1932 the population was on the verge of extirpation in the entire lower 48 states. Only 69 birds remained in and near Yellowstone National Park" (near and in the Red Rock Lakes). A few summering swans appeared in Minnesota in the early 1960s, following the 1960 release of 20 cygnets into the LaCreek National Wildlife Refuge in South Dakota from the Red Rock Lakes. That gave hope that a reintroduction in Minnesota could be possible, so in 1966, what was the Hennepin County Park Reserve District tried releasing 40 Trumpeters from the Red Rock Lakes there, but the birds disappeared; attempts showed more promise a decade later when people reared cygnets in captivity for 2 years before releasing them. 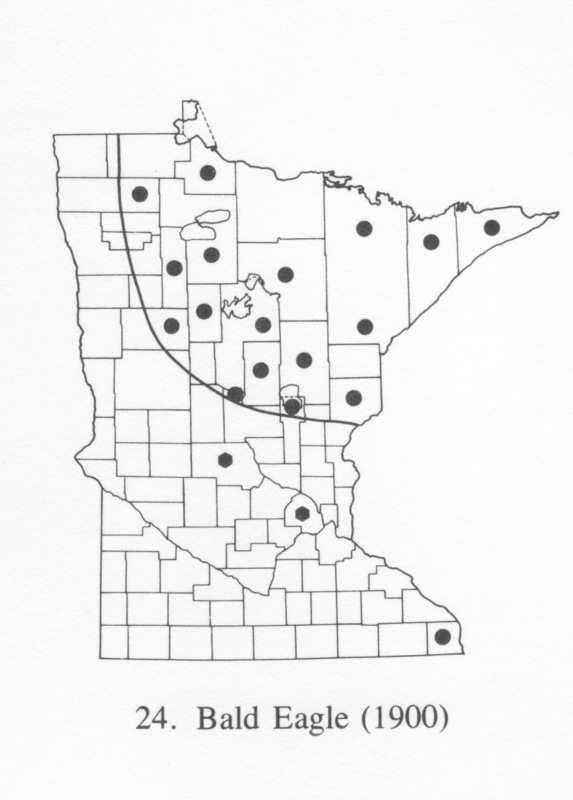 Birds from this project were first released in 1978, and the very next year, there was successful breeding in Minnesota. When the Minnesota DNR Nongame Wildlife program began, reintroduction of the Trumpeter Swan was one of the projects that made the chickadee checkoff for donations so successful. This exquisite bird that had been wiped out in the state by hunters in the first place is in jeopardy even today and, tragically, its problems are still due to hunting. According to the Minnesota DNR's Trumpeter Swan Restoration Project webpage, the main cause of mortality for Trumpeters in the state is still from lead poisoning from swallowing lead shot and lead sinkers. Lead poisoning is especially prevalent during droughts, when low water levels have the birds dabbling through the muck in areas of lakes usually too deep for that, where lead shot still lurks on the bottom from long, long ago. When swallowed as grit, the swans' gizzards grind it down and send it straight into the bloodstream. Lead pellets remain on the ground or in the water like tiny time bombs—indeed, some swan poisonings have occurred on lakes where no hunting has taken place in almost a century, because ending the hunting does not magically make the shot already present disappear. Lead sinkers are the other cause of lead poisoning in Trumpeter swans. Many hunters fought strenuously against banning lead shot for waterfowl hunting even as some hunters proposed the ban in the first place and fought strenuously for it. Enough hunters still resist any regulations about lead shot and bullets in upland habitat that it's still legal to use it despite how serious the problem of lead poisoning is for wildlife and for the hunters and their families as well. 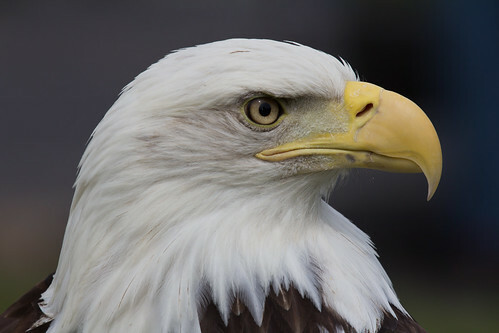 Grit-eating birds, including waterfowl feeding on grain fields, still ingest lead, and lead in gut piles and in any wounded game that eludes the hunter is still poisoning eagles and other scavengers. The second biggest cause of swan mortality in the state is from illegal shooting, sometimes by hunters mistaking the swans for other species, a serious hunter education issue, and sometimes intentionally, by poachers and vandals. The penalty is clearly not strong enough to serve as a deterrent. 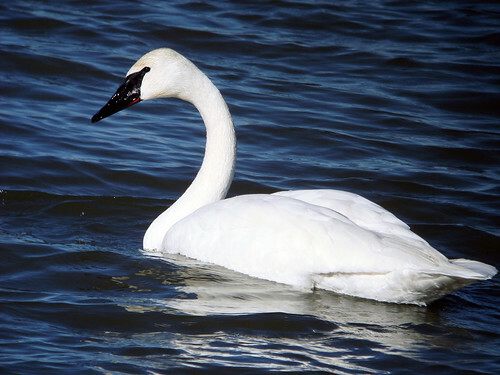 One hunter who shot a Tundra Swan in Lake of the Woods faced at most a $375 fine, and no threat of losing his firearm or his hunting license. Funding for trumpeter swan restoration is an ongoing need. 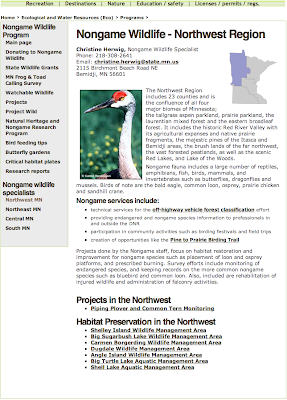 Minnesota's Trumpeter Swan Restoration Project is funded by the DNR Nongame Wildlife Program through donations from taxpayers to the Nongame Wildlife Checkoff on state tax forms. Additional funding comes from direct private donations. In 1987 I did a program about the Chickadee Checkoff mentioning the Trumpeter Swan among other species whose recovery it funded. 1987 radio program. Also in 1987 I did a program about hunters shooting swans, and how much the Nongame Wildlife Program spends per bird for their restoration. In 1989, I did a program about lead poisoning in Trumpeter Swans in Minnesota, and how expensive it was for the Raptor Center to treat them. As one of the original projects funded by the DNR Nongame Wildlife Program, people in the state of Minnesota have had almost 40 years to internalize that indeed, swans are NONgame wildlife here in the state, and many of us have donated to the chickadee checkoff specifically to help these splendid birds. Now, as the state considers opening a hunting season on swans, many of us who donated to the NON-game Wildlife Program feel betrayed. 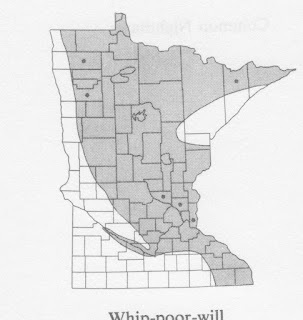 Of course, the Minnesota DNR Non-game Wildlife Program has already shown its disregard for the concept of NONgame wildlife by designating the Mourning Dove a game species here in 2004. Nationwide, the dove is the most heavily-harvested game bird, but hunting had been closed on it in Minnesota since 1947. In the forested northeastern part of the state, Mourning Doves are at the extreme northern limits of their range, with nowhere near enough population to support a hunt. Birds in my neck of the woods are here only because of backyard bird feeding. It's true that the Mourning Dove didn't receive any nongame funds to restore its numbers, but neither did it receive funds for game management in the state; its population is thriving thanks to agriculture and backyard bird-feeding. Changing the dove's designation to a game species here in Minnesota created a dangerous precedent. Duluth Audubon and I personally beseeched the DNR to prohibit hunting in the northeastern part of the state where the population is very low. And the north shore is an internationally significant hawk migration corridor where flying American Kestrels are often misidentified as doves. Hunting of several species in the state is restricted to some management areas, and this seemed very reasonable for dove hunting. The state's new Breeding Bird Atlas provides confirmation that doves are too rare in this part of the state to support a hunt. We also requested that as a brand new hunt, dove hunting in the state be restricted to non-lead shot. 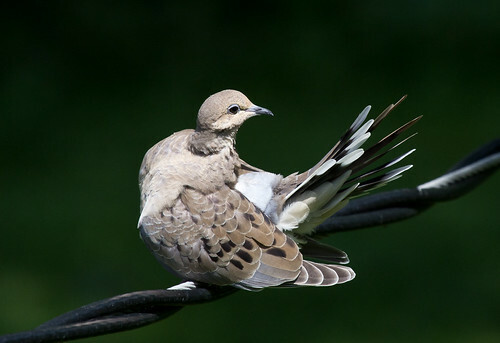 I provided citations from the annual US Fish and Wildlife Service's Mourning Dove reports to show that doves themselves suffer from exposure to lead from wasted shot, as well as information about how lead even in upland habitats was taking a toll on other species. But the DNR went into the hearings listening ONLY to hunters who wanted the hunt; they pooh-poohed both these requests out of hand. When the Minnesota Non-Game Wildlife program began, a few cynics said it was a ploy to get non-hunters to donate money to bring back species that would then be designated game birds, but most of us rejected that cynicism. Unfortunately, in the case of the Sandhill Crane, the cynics proved correct. This species was made a legal game bird in the Northwest Region of the state, the very region where it is still used to encourage people to support the Nongame Wildlife Program! The huge increase in Sandhill Cranes in our area was due to a huge, concerted effort led by the International Crane Foundation and several other non-profits and colleges, spearheading an annual crane count and researching the species' needs. And contributions to the DNR Nongame Wildlife Program were part of their recovery as well. Farmers have had some difficulties with cranes feeding on planted corn during spring, especially as the population of locally-nesting birds has increased—migrants passing through are gone from the state before planting season. Designating the crane a game species might be necessary now or in the future to manage their numbers, but that wasn't part of the DNR's rationale in changing their status, and they never held a fair and open hearing about it. Right now, there isn't any science to establish that the cranes hunted in the northwest region belong to a rapidly-expanding population. 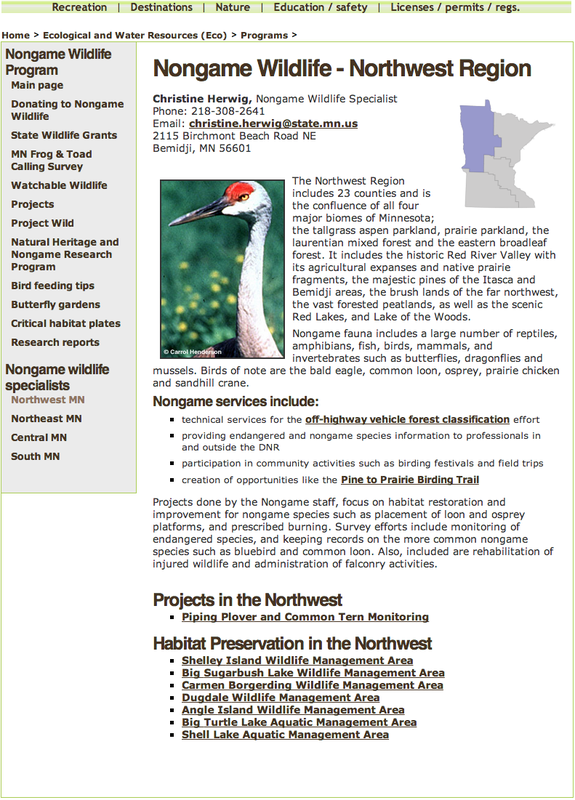 And even after several years of hunting, the DNR is still using the Sandhill Crane to encourage contributions to their Nongame Wildlife Program website. This is seriously wrong. Now that we're living in a world where the federal government talks about alternative facts, I guess I shouldn't be surprised that one of our state's departments would develop an alternative definition for the word nongame. But we've lost something important. Since the Migratory Bird Treaty Act was passed a century ago, we've had a large body of true conservationists made up of hunters and non-hunters both, with two groups of extremists, anti-hunters on one side and on the other side, poachers and "canned hunt" advocates who hate limits and regulations. As some of the state's game species have become too rare to be easily hunted, the DNR seems now to be losing their focus on restoring those species in trouble, and instead is forcing an ugly wedge between hunting and non-hunting conservationists like me who have a long history of supporting and defending the tradition of hunting and its important role in conservation, whether or not we ourselves hunt. Were the cynics right? Has the Nongame Wildlife Program been grabbing money from non-hunters to restore threatened species like cranes and wolves just so hunters could once again shoot them? If the Trumpeter Swan is designated a game species in the state after all the money, time, and effort non-hunting individuals and wildlife rehabbers put into restoring them and protecting them from the lead that hunters once spewed in wetlands and continue to spew in upland habitats, hunters will have squandered their reputation as conservationists. Is it time for our Minnesota Department of Natural Resources to change its name to the Minnesota Department of Game? Minnesota's Breeding Bird Atlas: A Splendid Resource! weigh 12.4 pounds, almost 4 pounds more than Pip. In 1932, the University of Minnesota Press published The Birds of Minnesota by Thomas Sadler Roberts. Roberts was far and away the most prominent ornithologist in the state—when the American Ornithologists’ Union was organized half a century before, in 1883, Roberts became one of the few original elected members. When the First Edition of The Birds of Minnesota was published, the AOU’s journal, The Auk, published a long, very positive review of the two-volume, 1500 page tome. Roberts's was the first work in Minnesota, and one of the first in the world, to include detailed information about precisely where and when each species of bird could be found, including breeding information, within the book’s coverage range. The Birds of Minnesota sold out almost immediately, and just four years later, at the height of the Depression, it was reissued in an updated Second Edition. Roberts, of course, hadn’t personally documented all the breeding activity in every corner of the state: birders here and there had been submitting information to him personally for years, and more formally via the Minnesota Ornithologists’ Union since it was founded in 1929. Birdwatchers throughout the country had been submitting data cards about bird sightings to the U.S. Fish and Wildlife Service since the 1800s as well. It was the collaboration of so many people, along with Roberts’s wonderful and charming descriptions of each species, that gave his work such longstanding value. Indeed, I quoted him here and there in my own American Birding Association Field Guide to Birds of Minnesota published last year. Year after year, we get new information as birds’ habits change. 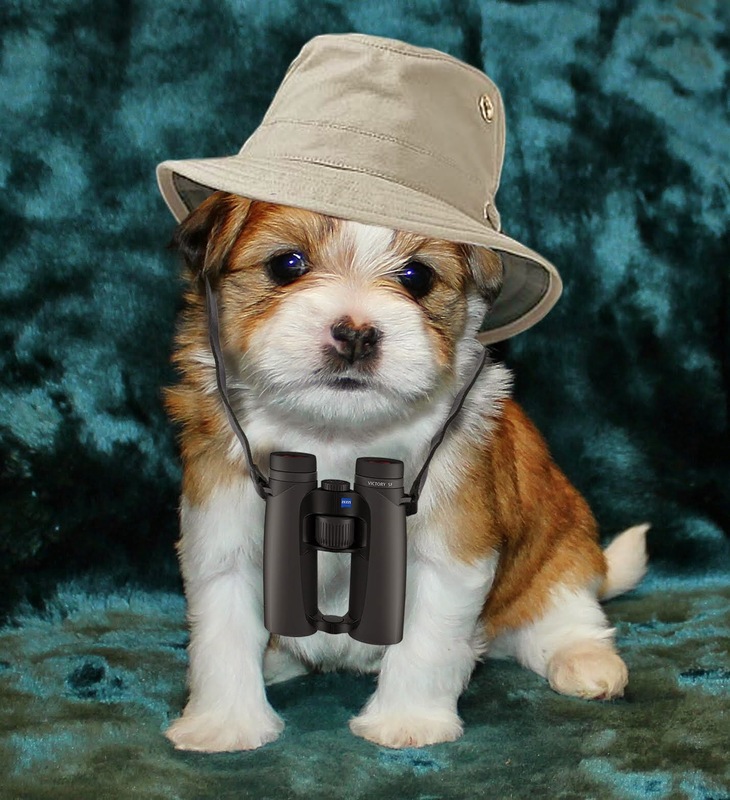 Every season countless birders reported their sightings to the MOU. In 1975, the University of Minnesota Press published Janet Green and Robert Janssen’s book, Minnesota Birds: Where, When, and How Many, which updated the state’s seasonal and geographical information. And in 1987, the University of Minnesota Press published Robert Janssen’s updated version, Birds in Minnesota. Birdlife continues to change. 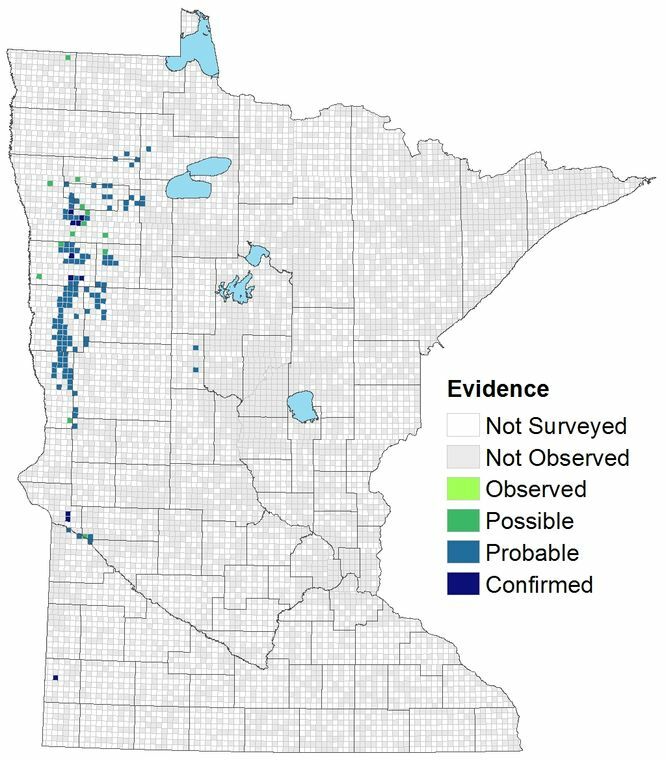 In 2009, Audubon Minnesota and the University of Minnesota Duluth’s Natural Resources Research Institute, with funding from the Minnesota Environmental and Natural Resources Trust Fund (from proceeds from the Minnesota Lottery), coordinated efforts with professionals and volunteers combing the state to compile the state’s very first Breeding Bird Atlas. This is not to be confused with the Breeding Bird Surveys that the US Geological Survey has been conducting since 1966—those involve 90 routes scattered throughout the state that are each surveyed just once a year, mostly in June. 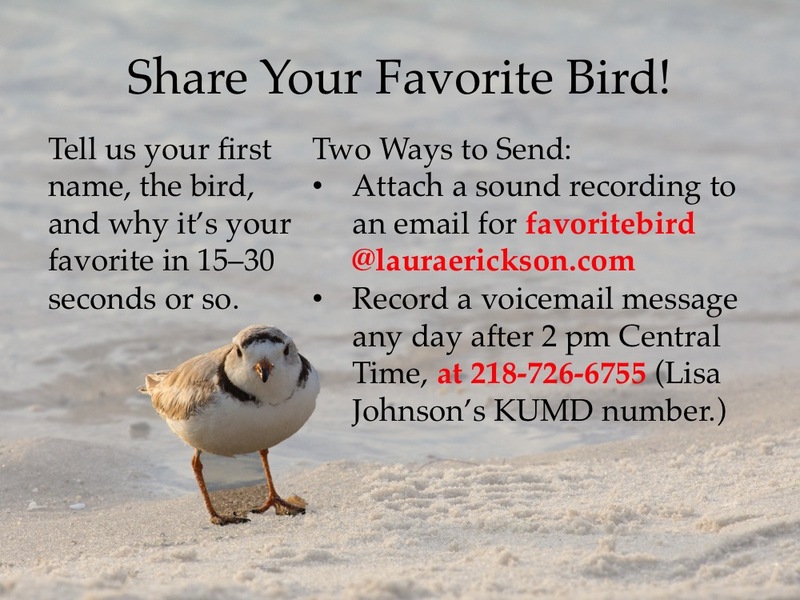 Participants count every bird seen or heard in a 3-minute time period at 50 stops. The Breeding Bird Survey gives us a great index to see, over time, which durnal species breeding in June are increasing, declining, or holding steady. 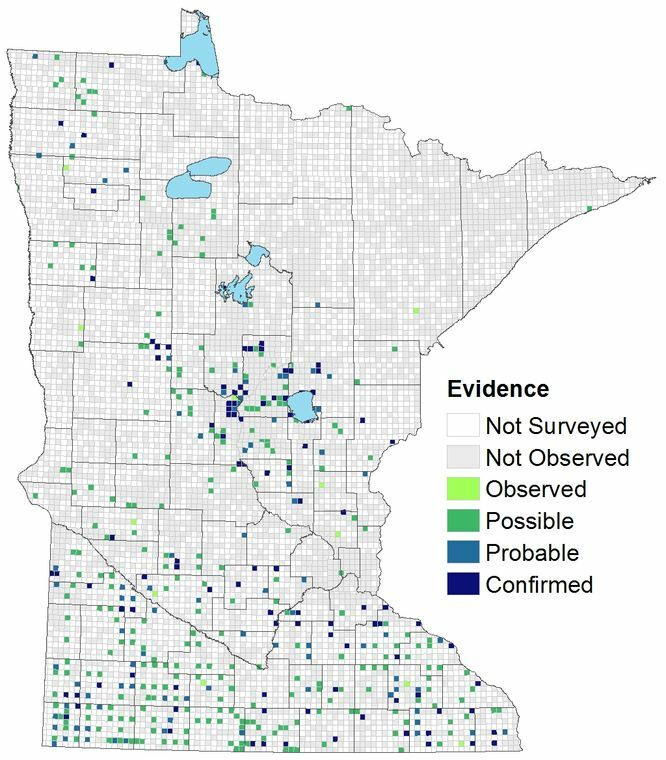 The state’s Breeding Bird Atlasers, 700 strong, scoured 2,353 townships, many of them multiple times over the entire breeding season, from mid-winter for owls, finches, and other early nesters through August for goldfinches and other late nesters, looking for solid confirmation of breeding. Some of the people conducting the Atlas surveys were trained students and professionals—my son Tom conducted some of the surveys—and others were volunteers—a few of my own sightings were entered into the database. During the process, the atlas project recorded more than 1 million observations, confirming 249 species breeding in the state. This project was not focused on population trends, but simply verifying where each species is now breeding. I can't get over how splendid the Atlas is. It's published online in an extraordinary and easily-accessible website. Each species account has a gorgeous and detailed map, which would have been valuable in and of itself, but the value is greatly magnified by the wealth of other authoritative information assembled by Lee Pfannmuller, Jerry Niemi, and the other authors, who used a great many resources to explain what we know about each species's range and its numbers from pre-settlement times through now, along with basic natural history facts. Each species account is both up to date and rich with historical information, all in one easy-to-find spot. Where available, the species accounts also include trend graphs from the Breeding Bird Survey and other valuable information. And the accounts are as beautifully written as they are detailed. 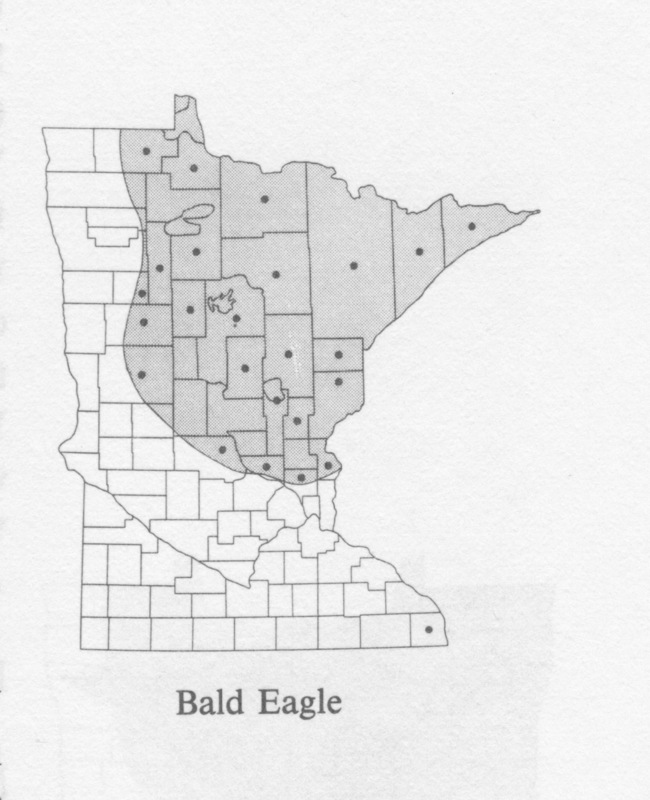 In 1975, Green and Janssen, in Minnesota Birds: Where, When, and How Many, noted that the eagle bred primarily in the northern regions of the state, with the area producing the most young in the Chippewa National Forest, and that since the 1960s, the only known active nest sited in the southern half of the state was in the Upper Mississippi National Wildlife Refuge in Houston County. 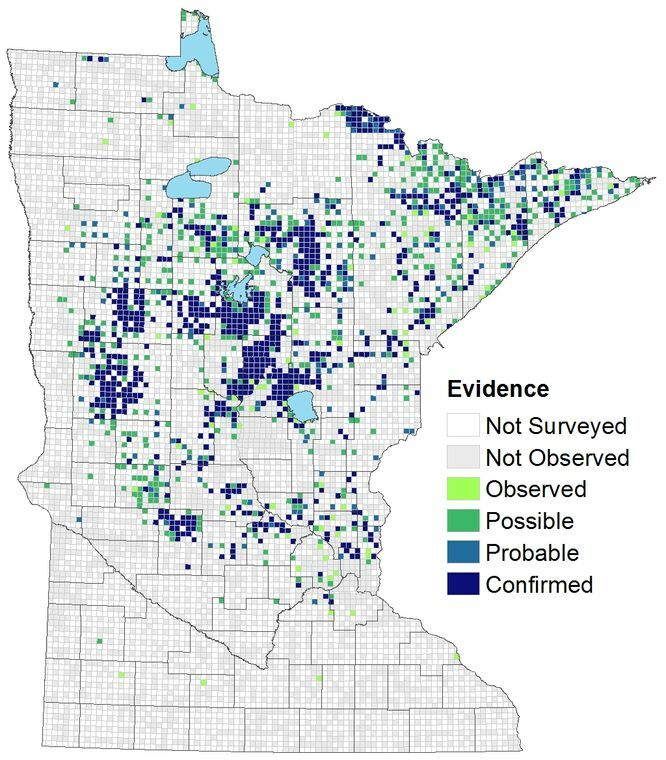 In 1987, after more than a decade of protection under the Endangered Species Act and more than a decade after DDT use was banned in the United States, Janssen wrote in his Birds in Minnesota, that a total of about 200 nests were known from the northern breeding areas and nesting territories were continuing to increase. At that point there were active nests both in Houston and Sherburne County. The Breeding Bird Survey shows steady low numbers from 1966 until the late 90s, when numbers started rising. 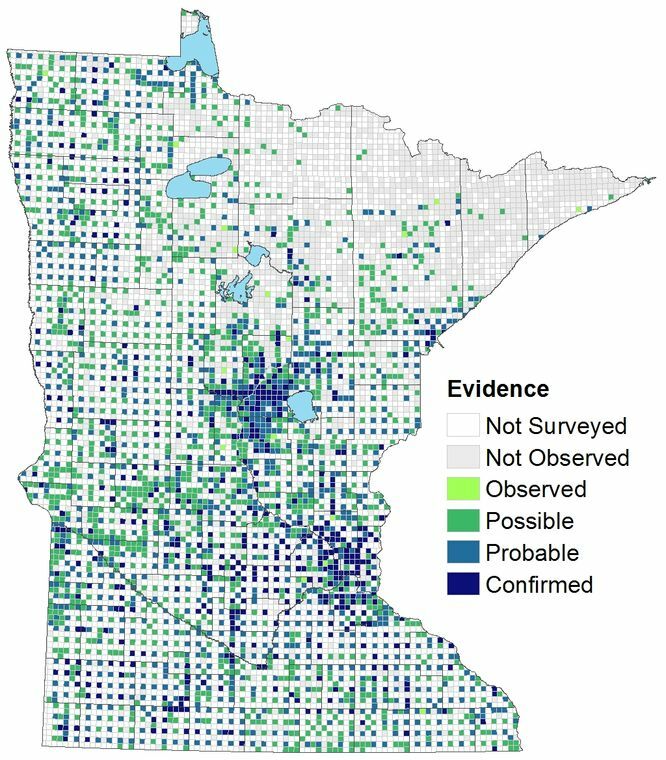 Minnesota’s Breeding Bird Atlas shows just how much more widespread nesting Bald Eagles are today. Having access to the three volumes of work makes it relatively easy for me to compare past and present. 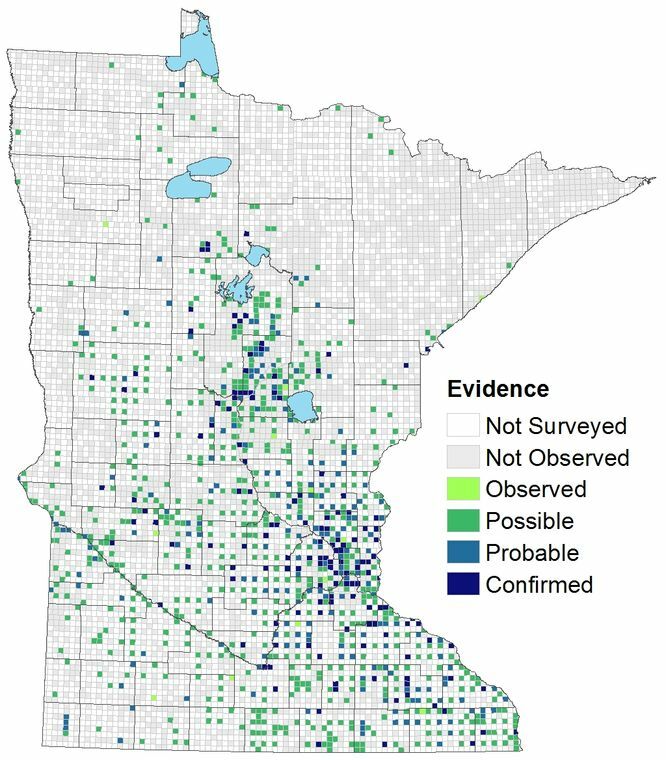 But the best thing about The First Minnesota Breeding Bird Atlas (2009-2013) is that I didn't actually need to go back to the earlier references: each individual species account includes all the comparison information! Although Minnesota supports the largest U.S. breeding population south of Alaska, the centers of greatest abundance are found in Canada. 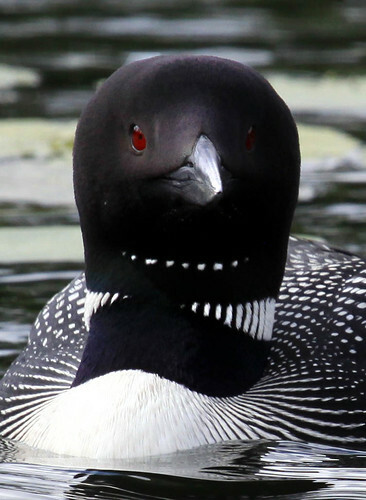 Historically, the Common Loon in the United States’ portion of the Great Lakes has experienced the greatest declines in both abundance and distribution (Evers et al. 2010). 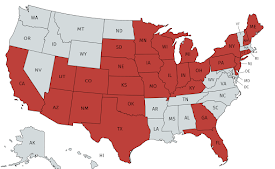 Indeed, the species has been extirpated in several states where it formerly occurred (Illinois, Indiana, Iowa, and Ohio), and its breeding ranges have receded northward since the late 1800s and early 1900s in Michigan, Wisconsin, and Minnesota. Nevertheless, the Great Lakes region now supports over 50% of the U.S. breeding population of the Common Loon. As noted earlier, Michigan, Ontario, and Minnesota have recently documented small southern range expansions. Focused conservation efforts by resource agencies and local lake associations are surely one of the principal factors responsible for the population increases that have been observed across much of the species’ range. 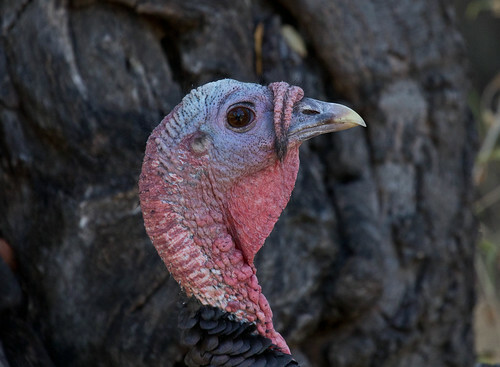 Regarding historic information about Wild Turkeys, T.S. Roberts wrote, “no eye-witness has left a written record so far as can be found and no Minnesota specimen is in existence.” I personally suspect that the introduction of Wild Turkeys here, which is inaccurately called a "re-introduction," will one day be considered as huge a problem for people and other species as the unnaturally high numbers of White-tailed Deer and Canada Geese. 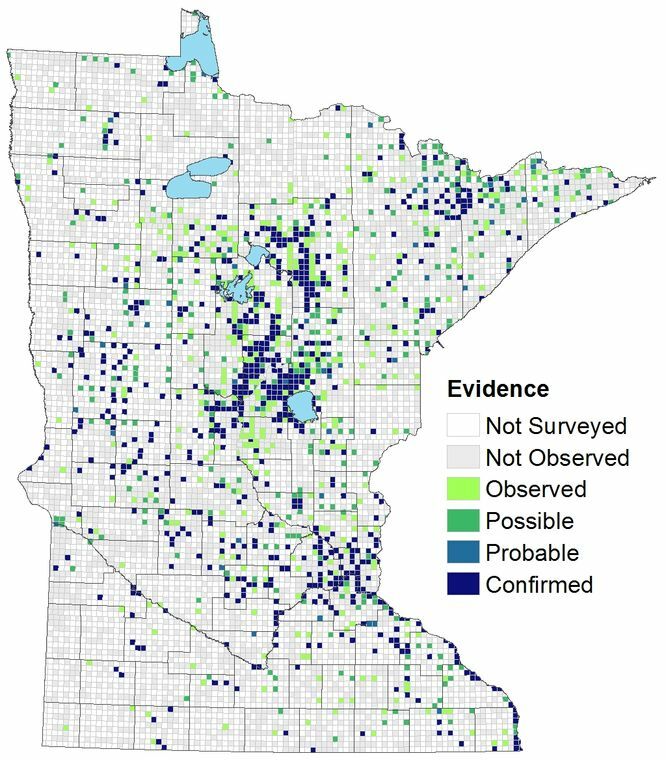 The participants in the MNBBA recorded only 4 records, and all were close to the Mississippi River in the dissected uplands that drain directly into the river in Houston, Wabasha, and Winona Counties (Figure 2). There is no question about the identification of the species or that 3 of them are confirmed records. 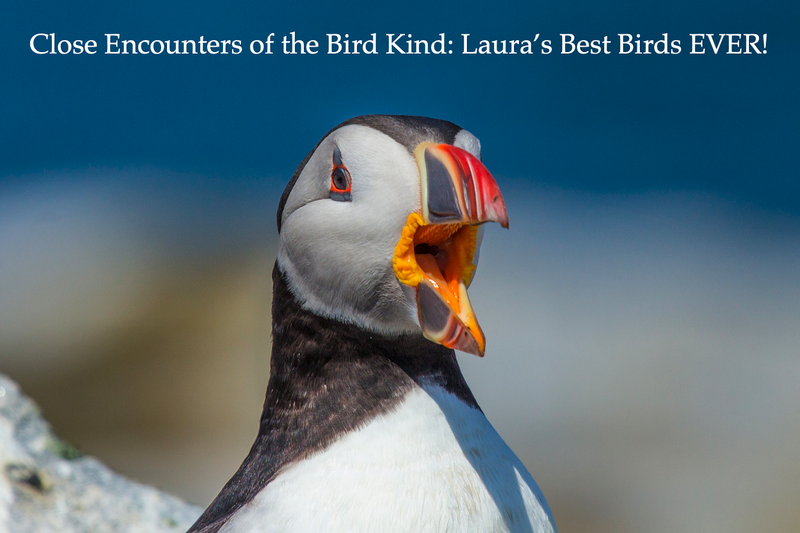 One record was just possible breeding evidence, and the observer guessed it was a released bird. Without better official monitoring and research about the origin of these quail, as well as others in the southeast, there is no way of knowing if they are native or released. 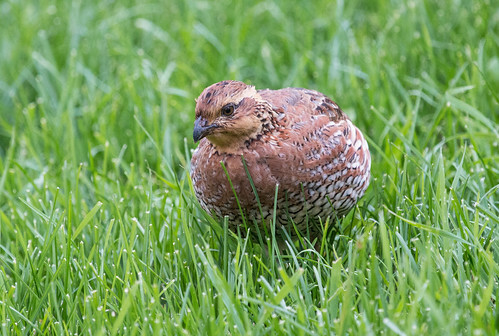 I hear reports of Bobwhites turning up in my own neighborhood in Duluth periodically. These birds are escapees from a retriever training club. They can't survive long up here, especially in winter. Hunters often tell me that to bring back any endangered bird, just make it a game species. Unfortunately, the Sharp-tailed Grouse and Greater Prairie-Chicken, two of our state's most splendid game species, aren't doing so well even as the Minnesota DNR encourages hunters to try for the "Minnesota Grand Slam," when a hunter shoots one each of our four native grouse species—Ruffed Grouse, Spruce Grouse, Greater Prairie-Chicken, and Sharp-tailed Grouse—within the state in a single season. 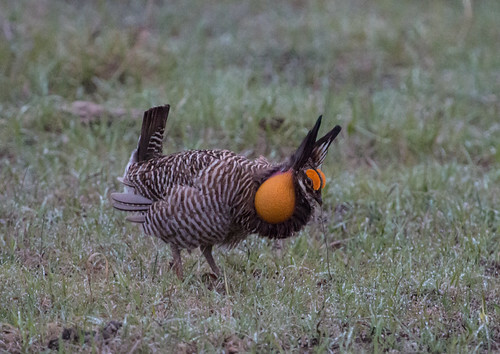 The Greater Prairie-Chicken is a "relative newcomer to the state’s western grasslands, having forced the northern retreat of the truly native grassland grouse, the Prairie Sharp-tailed Grouse." Even so, the prairie-chicken's range has shrunk in recent decades. Due to ... habitat issues, the species is officially listed as a Species in Greatest Conservation Need. The National Audubon Society labeled the Sharp-tailed Grouse as “climate endangered” and predicted a 76% loss of the species’ summer range by 2080 with changes in climate. The Minnesota Department of Natural Resources has a Sharp-tailed Grouse management plan that has been hampered by funding and implementation issues. One very sad decline in the years since I started birding has been of the Red-headed Woodpecker. This gorgeous bird was always rare in northeastern Minnesota, and overall, its range hasn't changed much: the Atlas notes, "Overall, the breeding distribution of the Red-headed Woodpecker has changed very little since Roberts wrote the first comprehensive account in 1932." But Breeding Bird Survey numbers since 1967 have shown a dramatic decline. 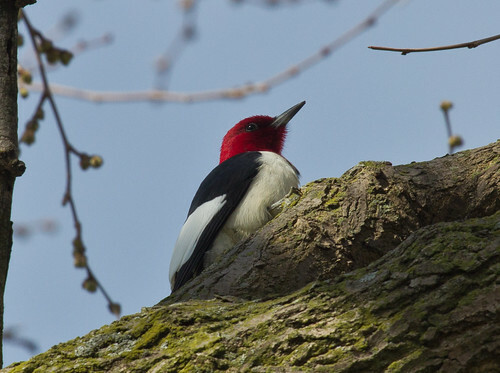 In Minnesota the Red-headed Woodpecker has been designated a Species of Greatest Conservation Need by the Minnesota Department of Natural Resources. Audubon Minnesota designated it a Target Conservation Species and prepared a statewide conservation plan. The plan adopted the national population objective for the species and outlined actions necessary to accomplish this goal, including protecting and restoring oak savanna habitat. nest in St. Louis County. 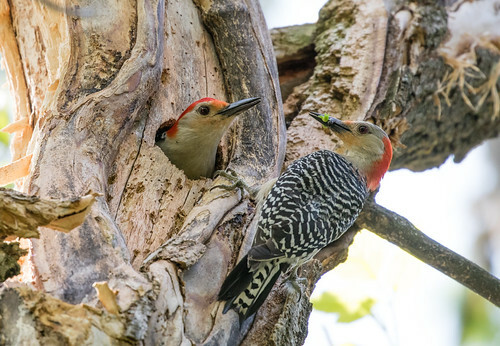 Another woodpecker, the Red-bellied Woodpecker, is doing amazingly well, not only expanding its range north but also becoming more abundant throughout its range in the state. In 1892, the species was unknown in the state; Roberts noted the first one he ever saw in the state in 1898. It continued to expand from the southeastern corner north and west through now. We've had solid evidence of red-bellieds breeding in St. Louis County for several years, with birders noting newly fledged young here and there in Duluth. In 2016, the first actual nest in the county was found in my own backyard; this nest in a box elder fledged at least one young. 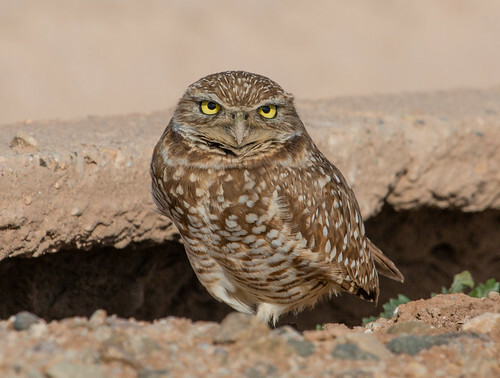 The Burrowing Owl's status in Minnesota is extremely difficult to tease out. 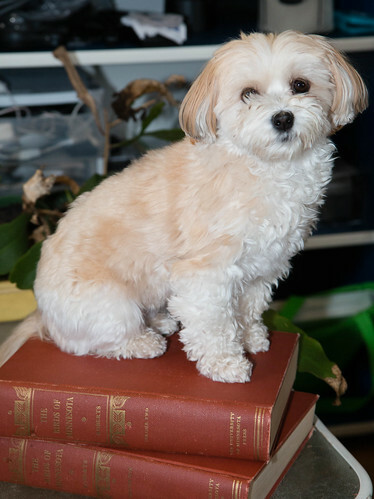 The Atlas provides a nuanced picture of what we know. We've had two successful nests in the state in this century, the last in 2007. Over the years, I can't begin to recount the number of times people have asked me about a bird they remember from childhood that they just don't hear anymore, the Eastern Whip-poor-will. 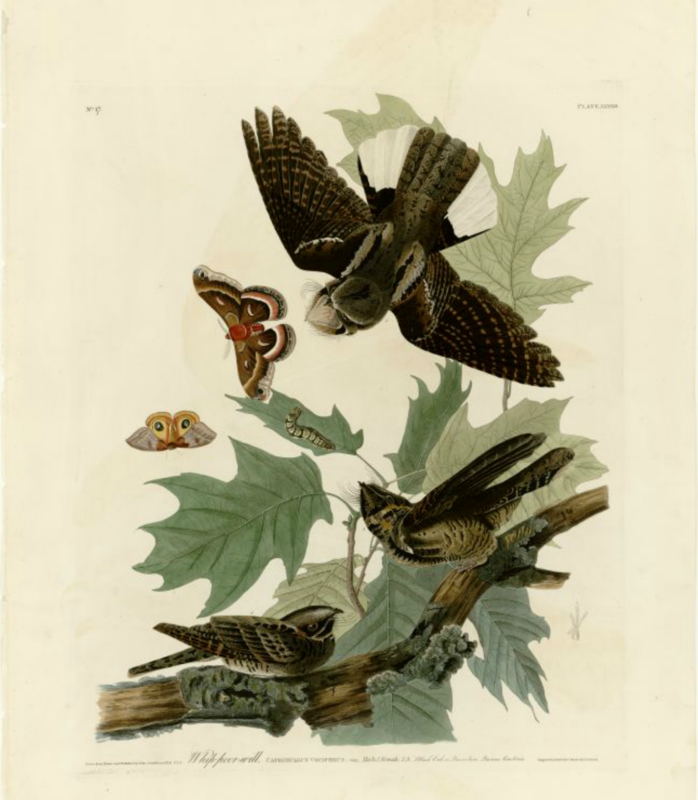 Because of its nocturnal habits, we don't have Breeding Bird Survey information about it, but those same nocturnal habits made it very conspicuous to explorers and pioneers who wrote about it as well as Minnesota's early ornithologists. It was considered common or abundant from sites as widespread as the Red River valley, central Minnesota, and the Twin Cities. I think this is a classic case of an obligate insectivore declining in response to declining numbers of moths and other flying insects. Scientists, especially in the U.K. and Europe, are finally starting to find ways of quantifying declines of insects from decades past. 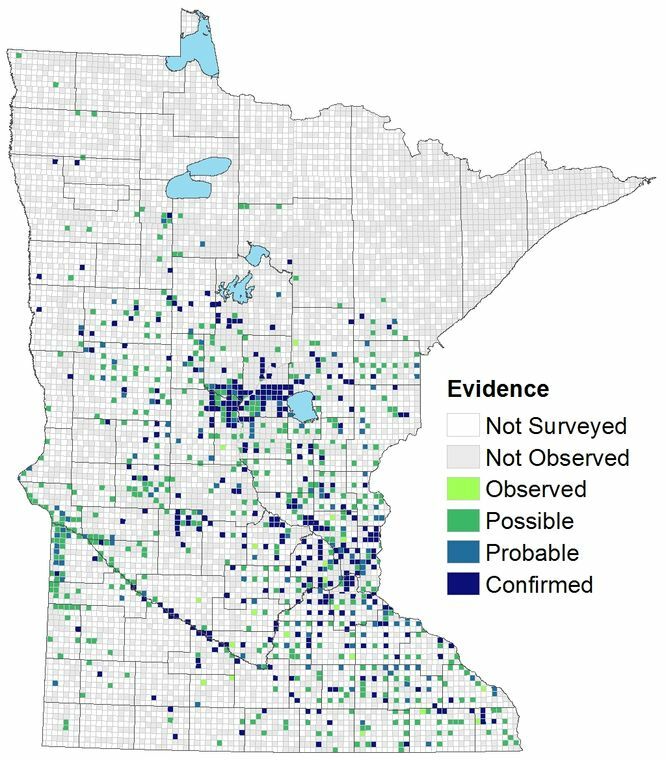 As we figure out how to do that here in Minnesota, I am confident that we'll start understanding more about the declines of the Whip-poor-will, Common Nighthawk, and Purple Martin. 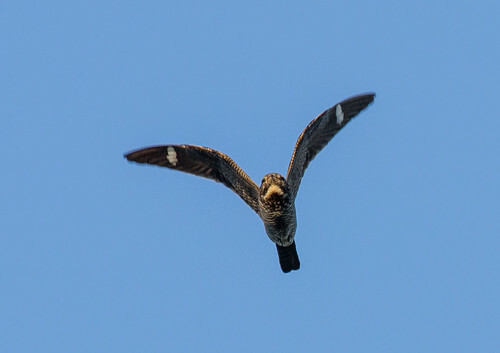 Many of us remember when Common Nighthawks nested on flat roofs in towns and cities. I loved hearing them peenting in the evening sky in downtown areas from New Orleans to Chicago and New York City. But nighthawks, who are defenseless against predators when they can't take off, didn't survive the urbanization of gulls and crows, both which are omnivorous predators. There still are lots of nighthawks, but nowhere near as many as in recent decades. Partners in Flight has designated the nighthawk a Common Bird in Steep Decline. It's also designated as a Species in Greatest Conservation Need by the Minnesota Department of Natural Resources. On a happier note, the Northern Cardinal is doing quite well. 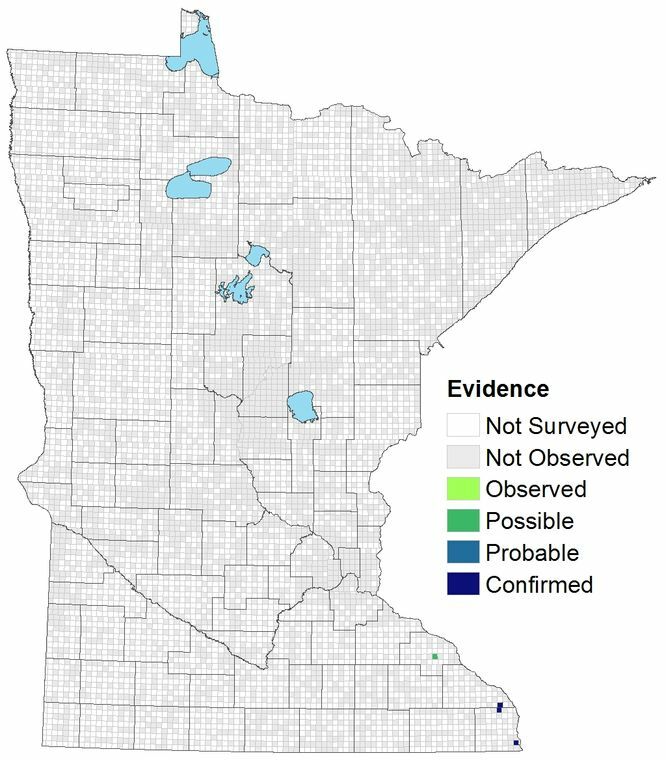 Originally, the species' range ended south of Minnesota—our first record was in Minneapolis in the fall of 1875, but little by little it became established as a permanent resident throughout the Mississippi Valley south of Red Wing, and from there it has continued to spread. Roberts reported nesting as far north as Hennepin County and as far west as Owatonna. 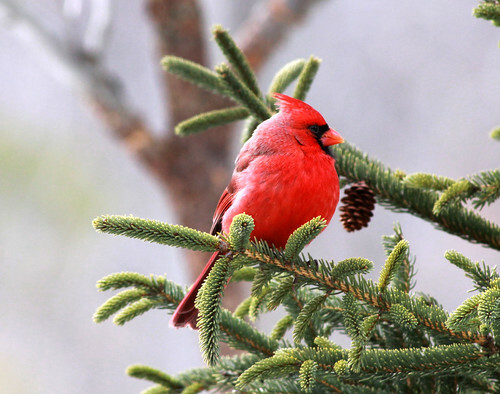 Now it's a regular nesting bird in Duluth and other isolated places in the northern third of the state, and has become fairly abundant in the southern two thirds, except its more scattered in far western Minnesota. 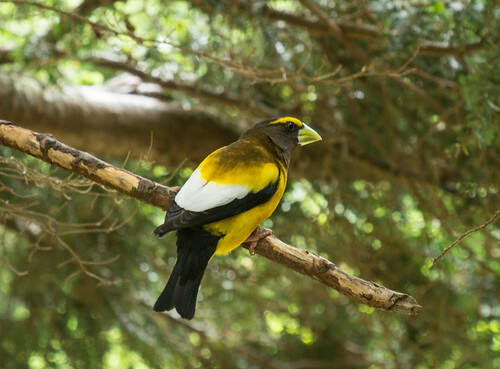 One of my favorite birds of all, the Evening Grosbeak, used to be much more abundant in northern Minnesota. I was thrilled with this particular Atlas species account because it provided a fair and balanced examination of both the widely held belief that their high numbers from the 1960s through the 80s were an aberration, Evening Grosbeaks previously being fairly uncommon in the Great Lakes area; and my own argument that they were fairly common in our area long before the 60s such that the decline since the 1980s is very troubling. The species account includes lots of supporting evidence for both arguments, allowing readers to come to their own conclusions. Whatever the early history of the species, all of us who remember their former abundance can't help but feel sad for their decline. 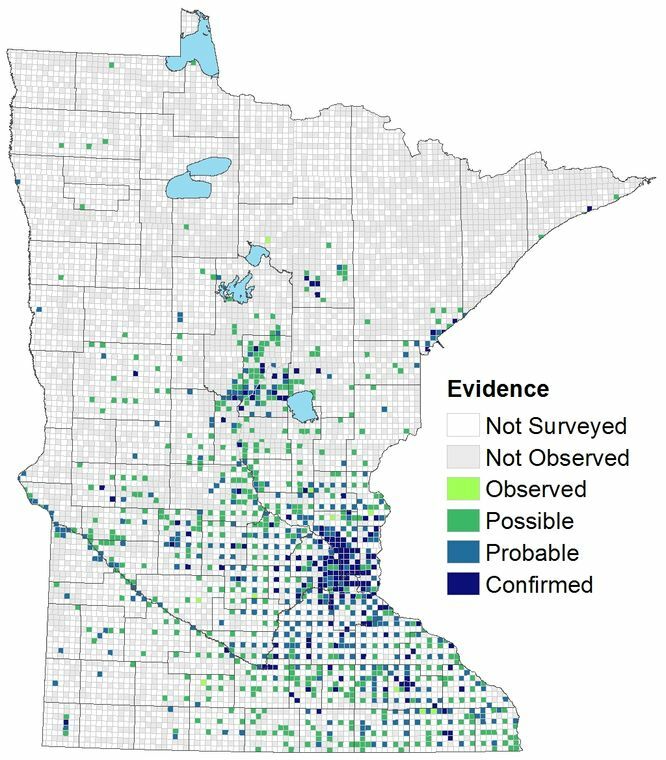 I'll be thrilled if the University of Minnesota Press issues the Breeding Bird Atlas in book form—I'd be one of the first to buy it, and would keep it next to my well-worn copies of The Birds of Minnesota, Minnesota Birds: Where, When, and How Many, and Birds in Minnesota. But even if it never gets published as a book, the online version is so complete and easy to use, with so much valuable information, that I'll be consulting it frequently from now on. Pfannmuller, L., G. Niemi, J. Green, B. Sample, N. Walton, E. Zlonis, T. Brown, A. Bracey, G. Host, J. Reed, K. Rewinkel, and N. Will. 2017. 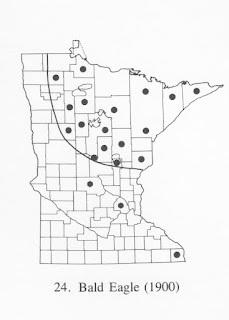 The First Minnesota Breeding Bird Atlas (2009-2013). Last Tuesday night, just when I was heading to bed, my good friend Susan sent me a text message. 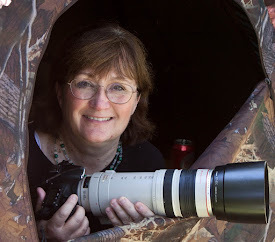 Like me, Susan lives in St. Louis County, but unlike mine up here in Minnesota, her St. Louis County is in Missouri, where for many years she’s been active with the World Bird Sanctuary, helping with bird banding. The owl-banding program there is fairly new—it started in 2012 as an experiment. No one could be sure if they'd catch any owls at all based on how few birders report Saw-whet Owls in that area. But on the first night, the very first time they checked their nets, there was a Northern Saw-whet Owl! They don’t capture as many as we do at migration points along the Great Lakes, especially at Hawk Ridge, but their banding program has proven to be a wonderful success. A few nights ago, they extracted owls from the nets 7 times, capturing five different individuals—two of them got caught a second time. Every year between October and early December they catch between 8 and 18—so far this year they’re up to 12. Saw-whet owl banding in this St. Louis County peaks in October; down there in that St. Louis County it peaks in November. but they put up with it all pretty gracefully. Percentage-wise, very few banded birds of any species are ever reported again. The biggest rates of return tend to be in game species because so many ducks are harvested every year, and duck hunters are conscientious about reporting every banded bird that they shoot. But as owl banding stations have become better and better at catching saw-whets, and as more and more of these banding programs have started up, we’re seeing more returns. Even with relatively few owls caught so far at the World Bird Sanctuary, their owl-banding program has already had a few returns. In 2016, they recaptured one originally banded in Ontario. And one bird they banded in 2014 was recaptured this summer at Whitefish Point in Michigan. Susan messaged me on Tuesday night as soon as she got home from banding because at 8:30, they'd caught a female saw-whet who was already bearing a band. It used to take weeks to trace a band number via the Patuxent Bird Banding Lab, but thanks to the miracle of the internet, it now takes moments. Susan already knew that this individual was banded on October 14, 2014, up here in Duluth! Susan took this photo with her cell phone to send me. It shows Frankie's spread wing illuminated by a black light. This was the sixth owl they’ve caught this season. To make it fun and easy to keep the individuals straight, they give them informal names as well as band numbers; like hurricanes, the first bird caught gets a name that starts with A and they run through the alphabet. They’re calling this one Frankie for the granddaughter of Pat Lueders, one of the banders. Amusingly, just as this little owl gives us a St. Louis County connection, she also gives us a Frankie connection, because the Bird Banding Lab sent confirmation that the bander who originally banded her is Frank Nicoletti, the Research Director for Hawk Ridge Bird Observatory. Most of the photos Susan sent me were taken by Pat Lueders while banding coordinator Linda Tossing held Frankie. One shows Frankie’s spread wing looking fluorescent pink. That photo was taken under the illumination of a black light. 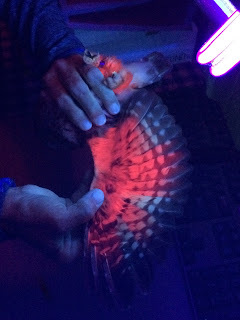 Frankie's wing under black lights. Photo by Pat Lueders. Understanding the predictable pattern of owl molt, banders can look at which primary and secondary feathers are bright pink and which aren’t to get a good estimate of the bird’s age. In 2014, Frank Nicoletti used Frankie’s molt stage to determine that she'd hatched in 2013. That makes her four years old now. Little by little these banding returns give us more and more information about how long birds live, and what their seasonal and geographic migration patterns are. Owls don’t have access to black lights, but it’s hard to imagine that they produce a pigment that they themselves can’t see, especially since we already know that a lot birds see ultraviolet wavelengths. My guess is that owls probably use the intensity of the color to select the best potential mates. How would that help? Because the pigment degrades fastest when exposed to sunlight, the individuals most skilled at finding and defending daytime roosts would retain the most pigment. And who knows? Saw-whets may also use molt pattern the way bird banders do, to figure out how old a potential mate is. For most birds, the older a potential mate the better, because older birds have more experience and proven survival skills. We humans apparently know this intuitively—why else would the expression be “wise old owl” rather than “wise young owl”?